James Schuman with Parents- he since lost his mother. James Schuman plotted to kill his wife during a dark parole period of divorcing- the man he plotted with was government- no one was hurt. He was convicted in 1997 has been in prison for over 20 years and wants nothing more but to be with is father in his last few years. Born in 1950, he is 68 and has multiple health problems. His son’s wife has been battling cancer for years. He has taken full responsibility for his crime. 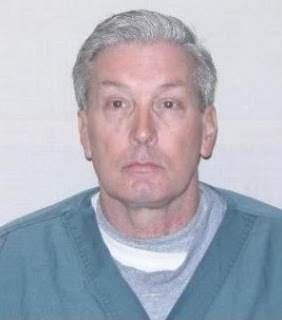 Despite all these factors, he has been denied parole on numerous occasions. Jim has no criminal record. He has an excellent work history and has job skills he could put to immediate use if paroled. Both his children strongly supported him throughout his trial. He has no major conduct reports. He has used his time in prison well, tutoring other inmates, working other jobs, and furthering his education where possible. Prison authorities have rated him as a low risk for violent behavior or committing another crime if released. Here are his son’s Skip’s words after reading a transcript from his father’s parole hearing: “It is my opinion, in all the previous hearings, the commissioners came across as completely biased with predetermined decisions. The use of incendiary, misleading sophistry shows no actual consideration or discussion for parole. One might think the parole commission would be more useful investigating and assisting inmates to target how they will support and establish themselves to be assets to society, rather than detaining a created, continued expense for taxpayers. h) I’ve completed all programming requested by WIDOC, plus considerable voluntary programs and education. i) My work and participation record has been excellent. k) I presently suffer fom supraventricular tachycardia ( heart issues), arthritis i joints and muscles. Severe pain in my shoulder and arm have left my right arm of little use due to poor health Care. m) If released I could get proper medical attention and be able to assist my elderly father. "It is time to release James Schuman." 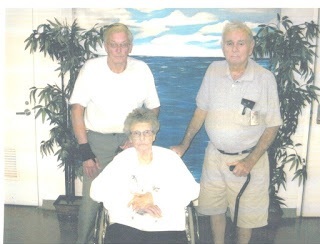 James is 65 and long rehabilitated- this is urgent as his mother is dying and he needs to be with her. He is no threat. Here address for signing the petition.Please help. Jim Schuman’s charges that he conspired to have his wife killed were the result of a never ending divorce/custody case that left him clinically depressed. The judge, frustrated over the parties’ inability to agree, at one point places his children into foster care. At this critical moment, in deteriorating health and suffering from deep depression, an employee, whose criminal past Jim was minimally aware of and who was later paid $1000 in crime stoppers’ money, approached Jim with a plan to have someone “scare his wife ”into resolving the divorce”. When Jim finally expressed interest, the employee went to the police saying Jim wanted his wife killed. The employee then introduced Jim to an undercover officer passing as a hit man Jim ultimately agreed to the “hit man’s” proposed plan. Jim states he intended to call off the plan but was arrested before he could do so. While no money was ever paid and no one was hurt, Jim was convicted of attempted murder and sentenced to 35 years in prison. Jim has no criminal record. He has an excellent work history and has job skills he could put to immediate use if paroled. Both his children strongly supported him throughout his trial. he has served 18 ½ years of his sentence, with absolutely no major conduct reports. He has used his time in prison well, tutoring other inmates, working other jobs, and furthering his education where possible. Prison authorities have rated him as a low risk for violent behavior or committing another crime if released. Jim is 64 Yrs old. Both his parents are in their mid 80’s and in poor health. His son’s wife has been battling cancer for years. He has taken full responsibility for his crime. Despite all these factors he has been denied parole on numerous occasions. 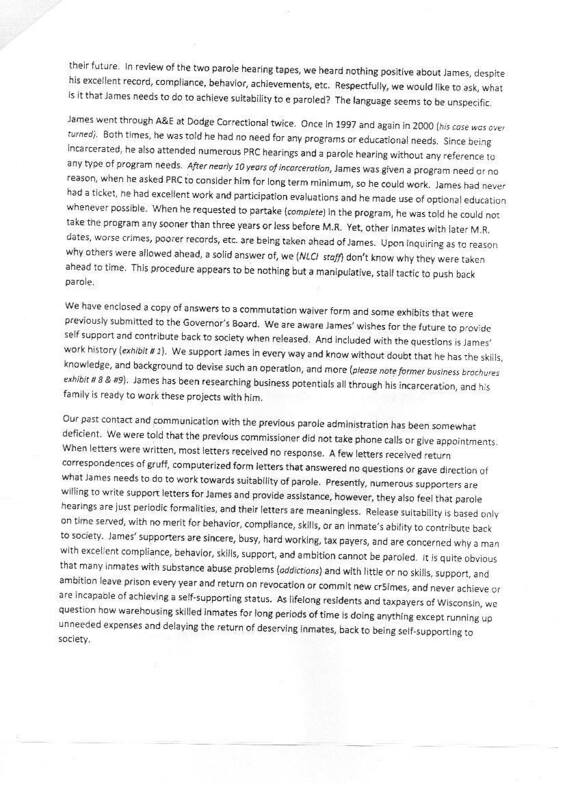 Here are his son’s Skip’s words after reading a transcript from his father’s parole hearing:“ It is my opinion, in all the previous hearings, the commissioners came across as completely biased with predetermined decisions. The use of incendiary, misleading sophistry shows no actual consideration or discussion for parole. One might think the parole commission would be more useful investigating and assisting inmates to target how they will support and establish their selves to be assets to society, rather than detaining a created, continued expense for taxpayers. It is time to release James Schuman. James Schuman is in his 60's and has parents in their 80's whose most profound need is to see their son finally home before they are released. 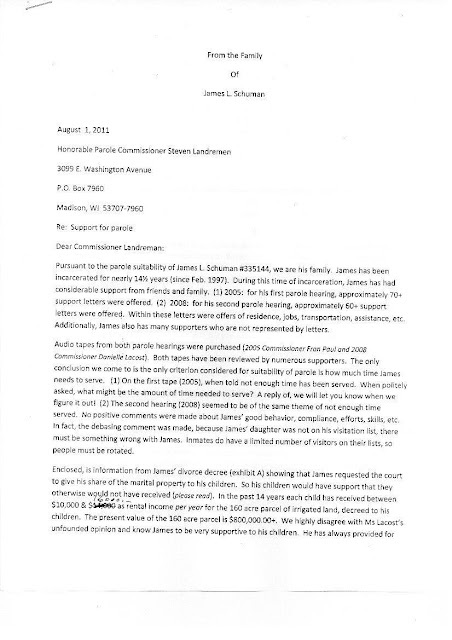 James himself has multiple health problems which the prison is not built to handle the health problem of aging inmates. Statistics show people of this age have a 0 to 1 % chance of breaking the law. What is the sense of keeping this man? The prison is dangerously overcrowded. 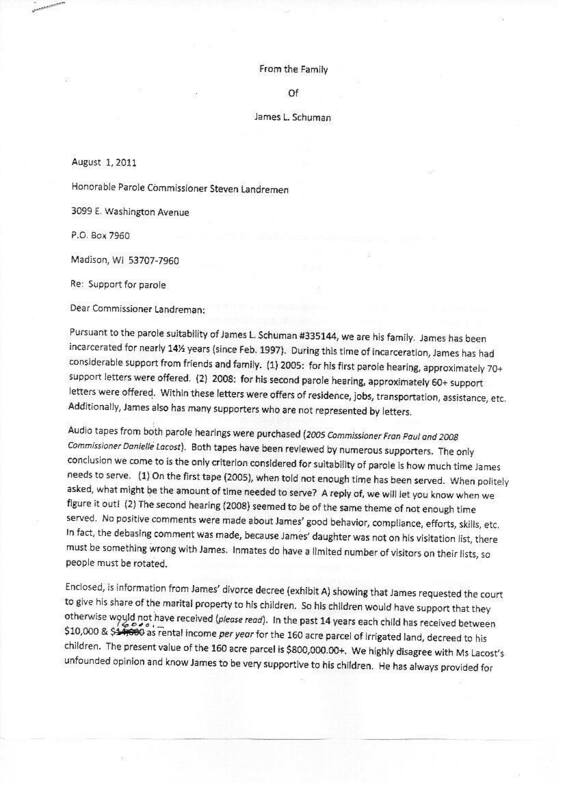 James has applied for compassionate release so he can be home for his parents and he was denied. Where is the humanity? 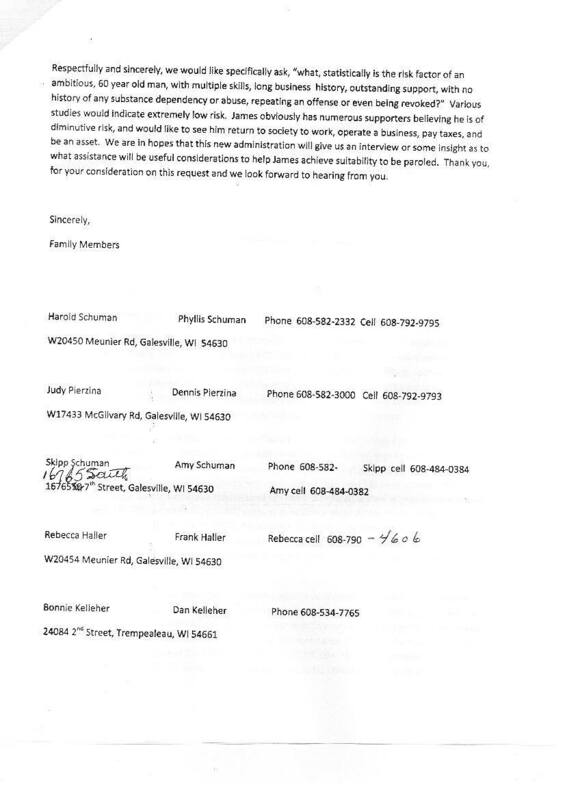 SCHEDULED TO SEE THE PAROLE BOARD IN 2014. (4) RELEASE AT THIS TIME WOULD INVOLVE AN UNREASONABLE RISK TO THE PUBLIC.